Being unable to sleep is one of the worst feelings someone has to go through in my opinion. I myself have trouble getting to sleep, and staying asleep, and this in turn has had a dramatic effect on my well being and happiness. It took me a while to establish a method to help ease my inability to sleep, and some nights it is more a struggle than others, however I have found these five tricks have helped me so much over the last couple of months, improving my quality of sleep. I have street lights outside my bedroom window which are a bit of a pain and did keep me up for a long time. It's more of a problem when I wake up in the night and the street light illuminates my room, making my brain think it's time to get up. I personally overcame this problem by getting an eye mask to sleep in (which somehow ends up on the floor in the morning?!) but you could invest in some black-out curtains to solve light pollution. It's also important to turn off any back lights; including TV, Mobile phone, iPad, etc. The lights in screens stimulate your brain, keeping you awake longer. I use my phone as my alarm so I tend to just turn the screen light as low as possible, so I can still use it without the light waking me up. One of the things that keeps my mind ticking at night is that I am constantly over-thinking the day, or worries I have. I have to listen to music, preferably soft acoustic or just instrumentals, as I'm drifting off so it fills my head space. I really enjoy the LUSH Spa Soundtracks actually. It sounds a bit stupid but I find it helps send me to sleep as my brain is listening to the music, rather than my own jumbled thoughts. I use a sleep timer of my iPod so it turns itself off after an hour, so I don't even have to worry about turning it off. Just make sure the headphone wires are kept in a safe place - please don't strangle yourself! I *try* my hardest to aim for a 10.30pm bedtime. Nights when my laptop goes off between 9.30 - 10pm I find I sleep so much better. Part of it is that your allowing your brain to relax after working on the computer - I do all my blogging and work off a laptop so if I'm logged on my brain is in use! Another reason this works is that the screen light won't keep you awake. My favourite past time - bathing. I adore having a long, long soak in the bath with bubbles and a bath bomb. Sometimes I'll take a book with me or light the candles. Sometimes I'll do a face mask. Just make sure you are relaxed in the bath, and do it after you've finished working or being on the computer so it is the final thing you do before putting a fresh set of PJs on and snuggling into bed. 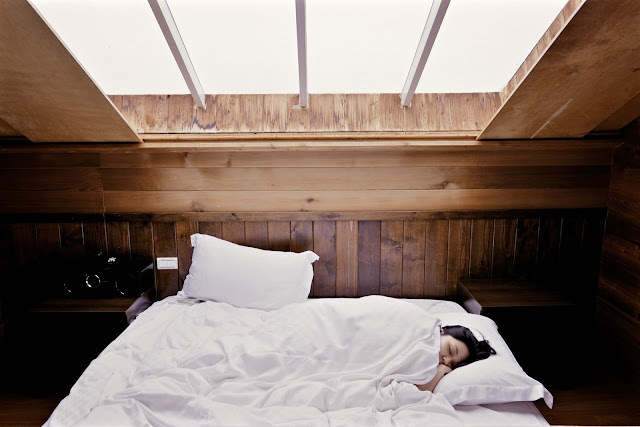 Do you have any top tips for aiding sleep? Write them in the comments below!